Today's video is a guest cooking vid from Beth @ Printcess! 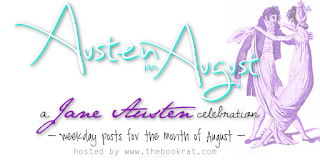 You can find more of Beth's posts sprinkled throughout Austen in August, here! And more of this year's AIA posts here! This recipe is for Salmagundy, which originated in 17th century England and was a popular side dish in the Regency. It's great for summer, because it's just a cold, layered casserole. Period recipe comes from The Art of Cookery Made Plain and Easy, but Mrs. Hannah Glasse. I've adapted it for modern tastes (the original recipe calls for anchovies, and is scaled for a dozen people). This adaptation is quick and easy, and feeds two people easily. Chop and layer as instructed in video, dress, and enjoy! If you make Salmagundy, please let us know your thoughts! And check out more of Beth's recipes every Friday during Austen in August! Oh this looks fantastic. I would love this. Thank you! Perfect for summer! Thanks, Beth! Sounds delicious. I will have to give it a try.